You too can design like garden photojournalist and author Debra Lee Baldwin. Trendy succulents are fun and easy to grow, which makes them perfect for dish gardens. Because they come from parts of the world with hot, arid climates, they can tolerate the dry air inside most homes, and they’re happy with little more than a spot by a sunny window. Since these undemanding plants often have small root systems, you can pot them up in a shallow dish, saucer, or other container. They’re seldom bothered by pests or diseases, but be sure to give them well-drained soil, and water only when the soil feels dry, to prevent possible rot. You can change up your succulent dish garden in many ways. Try growing the plants in a half of a clam shell or conch, and add a bit of driftwood or a piece of beach glass for whimsy. Containers like this are perfect for setting off the sculptural forms of succulents. To pick up subtle colors in their leaves, grow your succulents in a ceramic pot with a complementary glaze. They also look great in simple clay pots or garden urns. You can plant them in large containers, too, and some succulents, like jade plants, will grow as big as the container will allow. Read the tags on your plants to learn about its mature size. 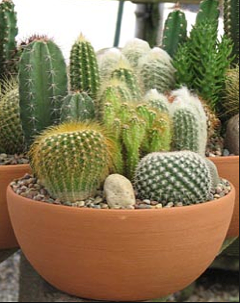 Whether you want a small grouping of cacti or a large bowl spilling over with a huge array of succulents. Different types of succulents and cacti look great when put together, adding a wide range of shapes, textures and colors to your miniature desert landscape. The creative possibilities for your own imaginative cactus dish garden scheme are endless. Your only restriction is to choose plants that require the same growing conditions if you want to grow them together. Succulents offer geometrical form and unique beauty all their own. Yet, somehow they seem to complement each other when planted together. Their green or blue-green color provides a common thread. Repeating similar shapes also gives continuity to a planting. 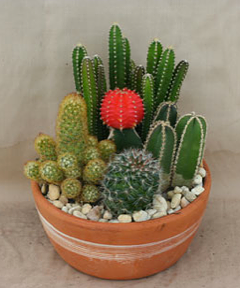 • A fast-draining, sandy mix, such as cactus potting mix works best for all types of succulents. • Choose a shallow container. Cacti and other succulents have shallow roots, so the dish only needs to be 3 in (8 cm) deep. A 9 in (23 cm) terra cotta bowl works fine. It doesn’t need to have drainage holes (but it should) because the sandy potting mix is fast-draining. Just be careful not to overwater. • You’ll need a small trowel to fill the cactus dish garden with potting mix. • A small, clean paintbrush comes in handy to clean off plants after they are planted. • Small decorative pebbles or rocks for the surface of the cactus dish garden. Before planting, set your plants in the dish to see how they’ll look together. Give it focus. Use 1 or 2 taller plants to give the arrangement a focal point. If you plan to display your dish garden against a wall or in a corner, place the taller plants in the back. For a dish in a central location to be viewed from all sides, put the tallest plants in the middle. Don’t overcrowd. You’ll want to show off the contrasting forms and textures of the plants. Giving your plants some space will also allow for growth and good air circulation. Repeat yourself. Add 2 or 3 of the same type of succulent, such as 2 column-shaped cacti or 3 rosette-shaped echeveria. Repeated forms give instant continuity to your garden. 1. Fill the dish half-full with potting mix. 2. Remove each plant from its pot and place in the new dish. Use your fingers to spread the roots over the mix, if necessary. 3. Once all plants are in place, add more mix to fill the container. Make sure the plants are sitting at the same depth as they were in their original pots. Lightly pat the potting mix around the plants, leaving about 1/2 in (1 cm) space below the rim of the container to allow for watering. 4. Use a small, soft paintbrush to gently remove any potting mix on plant leaves or between cacti spines. 5. Spread small stones or pebbles on the top of the soil after planting. A dressing of small stones will give your arrangement a finished look. Add decorative rocks to fill in gaps, if you want.